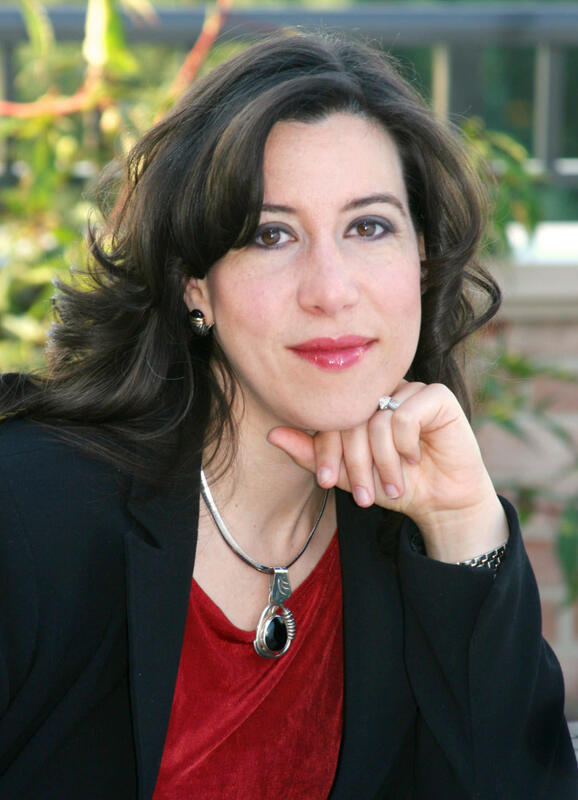 To take Seal the Deal principles beyond the book and into the real lives of professional service entrepreneurs, author, speaker and executive coach Suzi Pomerantz is available as an executive resource to media writers and producers nationwide. Small Office and Home Office (SOHO) Newsletter: A press release and Suzi's article "The Ten Keys to Building Your Services Business Beyond the Next Level" were featured in the December 2006 issue. Click here to view the newsletter or here to read the article. ICF Conference Presentation: Suzi recently presented a workshop entitled Seal the Deal: Critical Conversations to Demystify Networking, Marketing & Sales at the 2006 International Coach Federation Conference in St. Louis, an audio file of which will be available for download soon. NAFE News: Seal the Deal was recently profiled in NAFE News (page 8), a publication for the National Association of Female Executives. 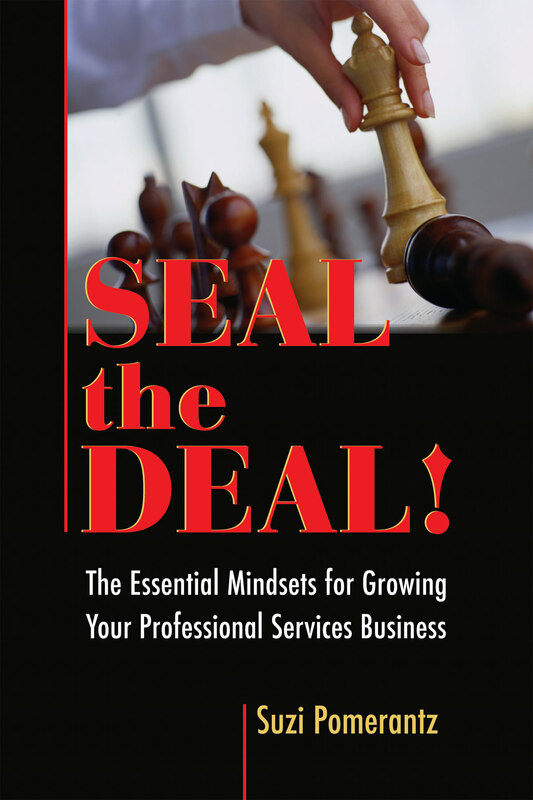 Released in November, Seal the Deal: The Essential Mindsets for Growing Your Professional Services Business, demystifies how successful coaches make money while making a difference. The innovative, 10-Step Seal the Deal system reveals how to integrate the critical trinity of networking, marketing and sales to find and land the ideal clients who need your genius. Julio Olalla, President, Newfield Network, Inc. Julio is considered one of the founding fathers of coaching. William H. Bergquist, PhD, President of the Professional School of Psychology, Author of 42 books, including Executive Coaching: An Appreciative Approach. "This book is structured brilliantly -- you have a chance to "eavesdrop" on an actual telecourse, on the Seal the Deal approach, where actual participants voice their questions, anxieties, and insights. It puts the reader right in the learning experience. Seal the Deal is very readable with a professional yet conversational tone. And you're never in doubt that Suzi knows what she's talking about!" 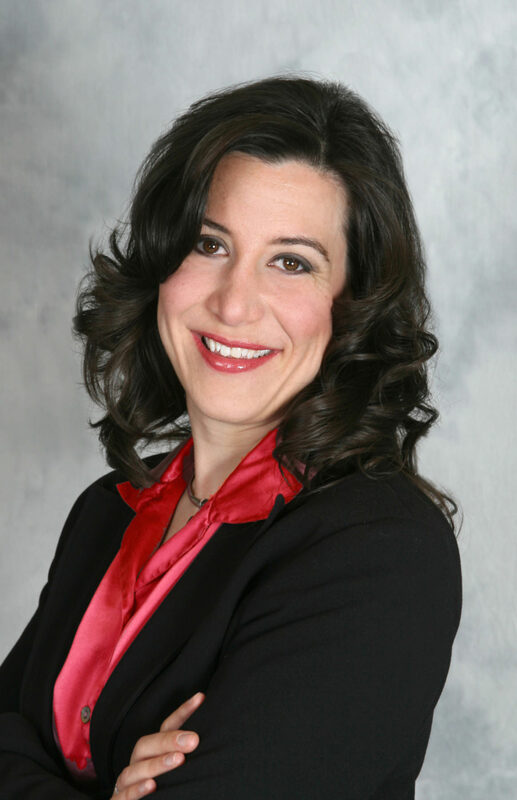 Jennifer Kalita, Entrepreneurial Consultant to the National Association of Baby Boomer Women and Author of The Home Office Parent. “If you are a professional services provider, here is an offer you can’t refuse. In her ten-step model for growing your business, Suzi Pomerantz shows you how to network, market and sell as a natural act — a game that you can play and win and have fun while you’re doing it. Reading this book is like having Suzi as your personal sales coach, while you follow her roadmap and dramatically expand your business in a systematic and sustainable way. Seal the Deal is the real deal! Don Arnoudse, Executive Coach and founder of The 2nd Half, coaches successful people who are reinventing themselves for a thrilling and fulfilling second half of life. 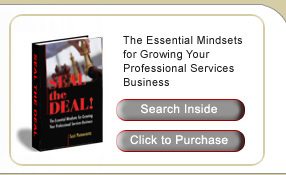 "Seal The Deal is a great resource for new and experienced coaches, consultants and others! I found the straightforward approach that Pomerantz used to share her considerable wisdom and experience to be very effective. It can reduce the learning curve for anyone that wants to make a difference and make money. I highly recommend that others read her book and buy one for someone else that would benefit from it as well." 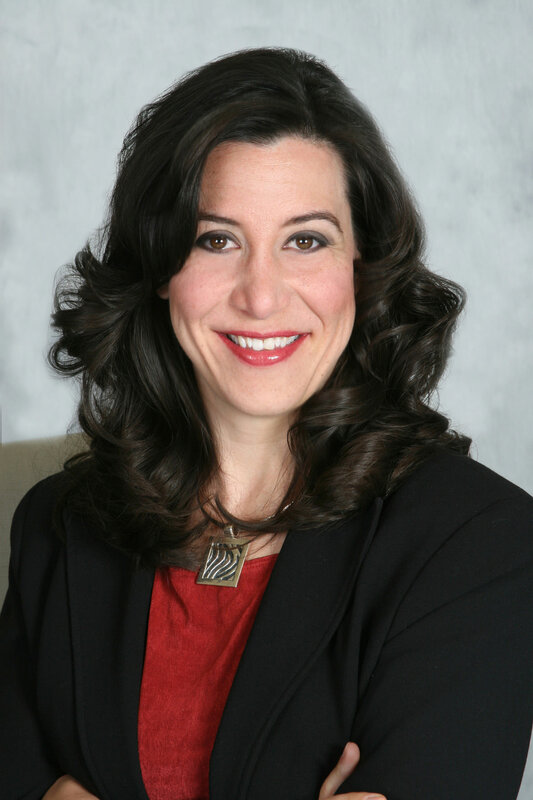 Angela Wagner, CPCC, Executive Coach and top-performing executive, Accenture. Angela spearheaded internal coaching at Accenture and became the firm’s first full time senior executive coach, founded Accenture’s Coaching Community of Practice. You say that networking, marketing and sales are not enough. Why? What is the “critical trinity” and what real difference does it make in business? Why don’t businesses inherently do this? Is it difficult? Illogical? Not taught in business schools? Your book focuses on professional service providers. Why and how is their business growth different from other types of business owners? In an era where people are leaving Corporate America in droves for the freedom of entrepreneurship, how can a professional service provider compete? What would you say to the thousands of baby boomers who are taking retirement and putting their thirty years of corporate experience to work for them in their own consultancies? Does the Seal the Deal methodology change at all during this stage of the game, where retirement funds are more vulnerable? Can you give some examples of successful service providers who have seen measurable growth after using the critical trinity in concert? While the 10-step strategic formula and “critical trinity” behind Seal the Deal can easily fill up a broadcast interview or full-length article, we understand that instead of covering just one book or featuring just one consultant, most media are looking for more comprehensive topics into which they can incorporate several components and points of view. The Internet has allowed entrepreneurs to multiply exponentially, without the need for expensive startup costs or costly overhead. How can new entrepreneurs differentiate themselves in an all-too-crowded marketplace? Assuming a level skill set, why do some entrepreneurs thrive, while others can barely survive? Most solopreneurs understand that they need marketing to stay in business, but few understand what this means or what good marketing looks like. What are the top five marketing mistakes that solopreneurs make over and over again? What are the five best ways to boost your marketing? What is the essential marketing success mindset? Day after day, successful executives, attorneys and medical practitioners abandon their steel towers in the name of self-employment. What effect does it have on large corporations and big firms when executives leave to forge their own paths…only to return after a failed attempt at entrepreneurship? Many perfectly competent professional service providers play much smaller than they need to. They dream of taking their services into big corporations, but often stop before they ever get started. Why do people who have the vision and tenacity to take a chance on entrepreneurship suddenly lose their nerve when it comes to really growing their businesses? How do average entrepreneurs sell their services to the large companies and firms that can afford them? Seal the Deal author Suzi Pomerantz, MT, MCC is an international Master Certified Coach, performance consultant, facilitator, corporate trainer and author with over 15 years of coaching and teaching experience working with leaders and teams in over 115 organizations internationally, including 7 companies on the Fortune 100 list, 11 law firms, 6 corporate law departments, and 3 legal service providers. Suzi's strength lies in helping leaders and organizations find clarity within chaos. Her clients include leaders and teams from Accenture, DuPont, Lockheed Martin, PriceWaterhouseCoopers, Tyco, General Motors, Sears, Welch’s, Pfizer, American Express Financial Advisors, Freddie Mac and many others. Suzi helps leaders to clarify their vision and exceed prior performance. She provides executive coaching, team coaching, and emerging leader coaching in organizations to assist executives and their teams with setting strategic direction for their organizations, managing talent, and developing leadership bench strength. She also develops leaders in teambuilding, sales, planning and conducting effective meetings, and facilitating change. She helps organizations develop and retain leadership capacity by coaching leaders in executive presence, presentation skills, personal power, communication, and vision work. Suzi specializes in business development coaching in the relational intersection between sales, marketing, and networking. She helps leaders to demystify the sales process and implement a systematic process for business development. The development and growth of the nationally acclaimed DuPont Legal Model, which cut outside legal expenses by 48% producing bottom-line savings in excess of $50 million. The leaders of a leadership development firm to articulate and achieve their vision and accomplish “that long-sought-after clarity” about the future growth of their business, which contributed to expanding into two new target market segments while doubling their number of associates. A recognized leader passionate about excellence and integrity in organizations and stewardship of the profession of coaching, Suzi has presented as well as participated for 7 years at the International Executive Coaching Summit, an invitation-only annual gathering of senior executive coaching experts, and taught executive coaches at the Executive Coach Academy. She has also delivered guest lectures at George Washington University, Loyola University, and the University of Virginia. She served on both the Executive Coaching Committee and the Application Review Committee of the International Coach Federation and served on the International Executive Coaching Summit Planning team for three years. Suzi is a founding member of the International Journal of Coaching in Organizations (IJCO) and currently serves a second term on the editorial board. She is also a founding member, Vice President, and founding board member of the International Consortium for Coaching in Organizations (ICCO), and currently serves her second term on that board as well. In addition, she was the founding Vice President of POWER, a non-profit organization that provides trainers and consultants to charitable organizations. 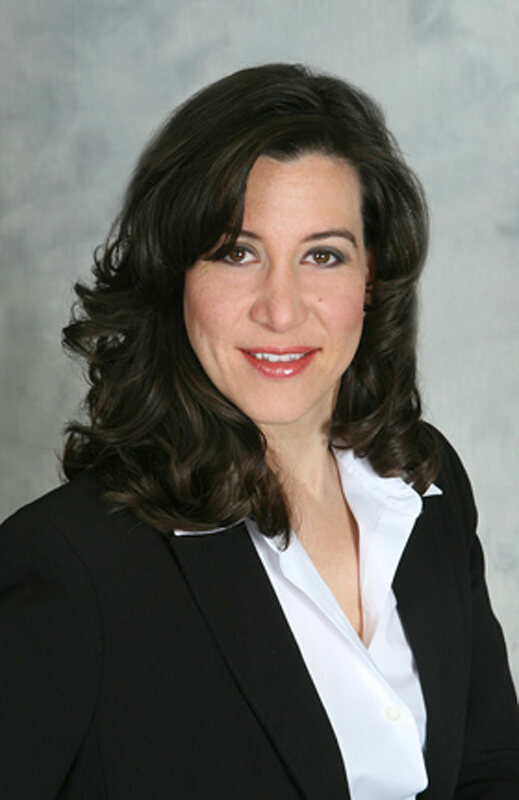 Suzi holds a Bachelor of Arts degree from the University of Virginia and a Master's degree from the University of Virginia's Curry School of Education. Her honors include Kappi Delta Pi International Education Honor Society, Dean's List, and Lawn Resident (Thomas Jefferson's Academical Village). In addition to her academic achievements, Suzi is credited with ten publications about coaching and business development, including Is Your Net Working?, Ethically Speaking: Ethics and the Executive Coach, Coaching Teams, and The Ten Keys to Building Your Coaching Business Beyond the Next Level as well as two books, including Seal the Deal: The Essential Mindsets For Growing Your Professional Services Business (HRD Press, 2006). 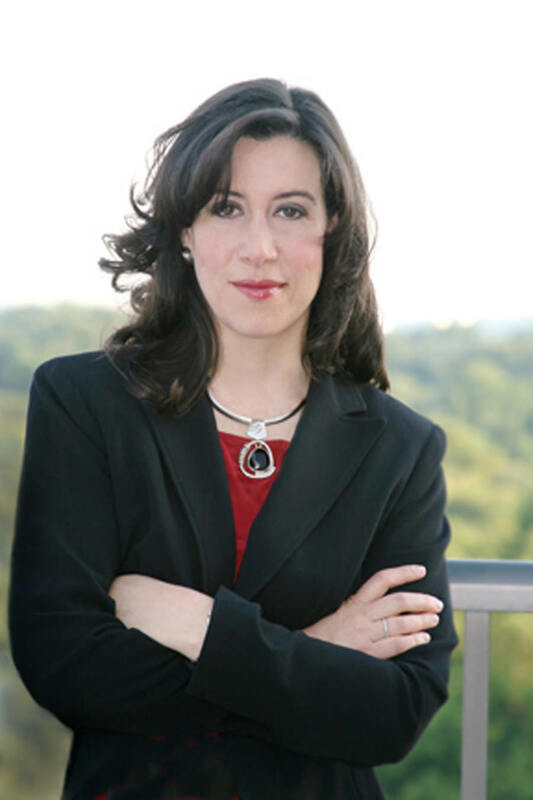 Beginning in 2007, Suzi will provide executive coaching services to the internationally ranked Darden School of Business at the University of Virginia. The business school will integrate coaching services into its MBA for Executives Program. For more recent, updated photos, click here.